I am one of those people who grew up living in the same house as my parents have lived there for 30 years. My grandma still lives in the house that my grandpa built. That's what I grew up knowing. Since moving out of home I haven't stayed in one place longer than a couple of years. I would say that's the fault of renting but at one point in there I owned a house too. This latest move has taken a lot out of me. I've been stressed and exhausted. The owner wanted to move back in and although we were given a 2 month time frame we really only found somewhere 2 weeks out. This put a lot of stress on all of us. 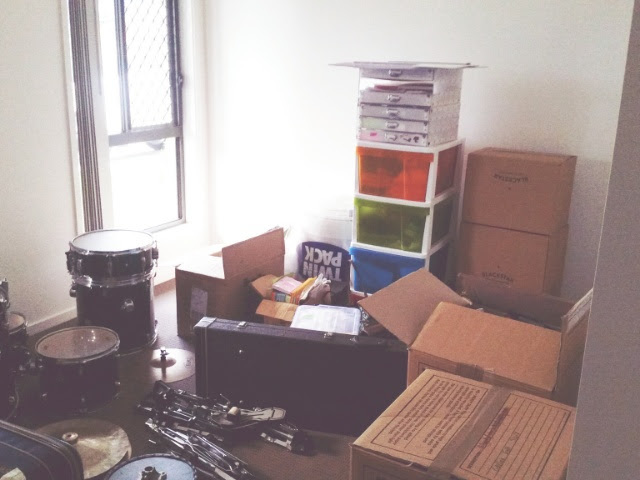 Also when out entire townhouse is so tiny it's really hard to find room for the boxes which added to the mess. Honestly it was extremely hard to keep up with everything and it didn't help that I am still working full time. 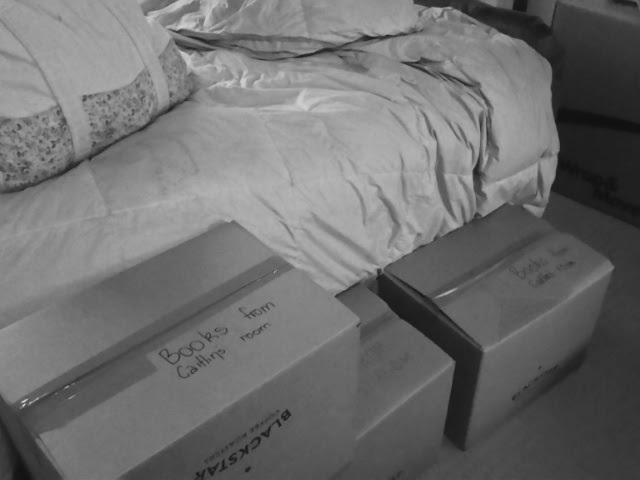 We had boxes stacked up around beds and everywhere. We have now officially moved out of the old place and into the new place. It's a 4 bedroom house and we are just loving the space. The crazy thing is we will only need to get one piece of furniture for the new house and that is a dining table and chairs. That is all! How did we fit the whole house in a tiny place for 2 years? I think the only reason we fit is because we had to! That place just never worked with our stuff. In the end this place is going to be much better. Particularly because there is one room JUST for me! I get a craft room again! Ohk the wardrobe will be general storage but the rest of the room is mine to work with and in. I'm going to be able to get away and study or work as needed. Of course we need to get everything else away so that I can organise and tidy that room as it will be the last one I sort! Once the little man sorts his room we can stick the drum kit in there... This will also be a study for me so I'm getting a couple of desks from mum to go in front of the windows ... I will have a lot of study to do! So that gives everyone a very good idea what has been occupying my head space and mind this last month particularly. I will be so excited to get this place set up so we can use it. I am getting together a post on my granny stripe blanket. It was the only project I've had going while I've been moving. A needle to sew in threads and the blanket are easy to tote around. I have managed to finish finish it so I am organising a recap post and hopefully going to be able to get a good photo of the blanket this weekend. Can't have too many photos! I have many ideas of projects I want to do and start... but how many I actually achieve at the moment is up for debate. Oh well... at least the worst of the crazy is over and we are back to our regularly scheduled program. Great news! Congratulations on your new home. Congrats on your move and your craft room! Congrats on the new home....and especially having your own craft room! Have fun! Congratulations on the house move. I have vowed never to move again! Nice to have a dedicated craft room though. Moving is so not fun. Enjoy your new space. YAY your own space! I understand about the moving stress, we are getting ready for a move next month and I am not looking forward to it at all but at least it won't be as bad as when we moved across country last year! :) Enjoy your new room place and your own space!